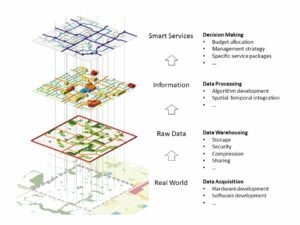 Ai Group dedicates its effort towards establishing a comprehensive, spatially-enabled transportation infrastructure and asset data platform to better manage, support and sustain the current and future transportation infrastructure system, via employing imagery, mobile LiDAR, and GPS/GIS technologies, and developing computer vision, machine learning, and spatial analysis methods. Ai Group will continuously look for talented undergraduate, graduate and postdoctoral researchers. Research assistantship and other sponsorship will be provided for qualified candidates. 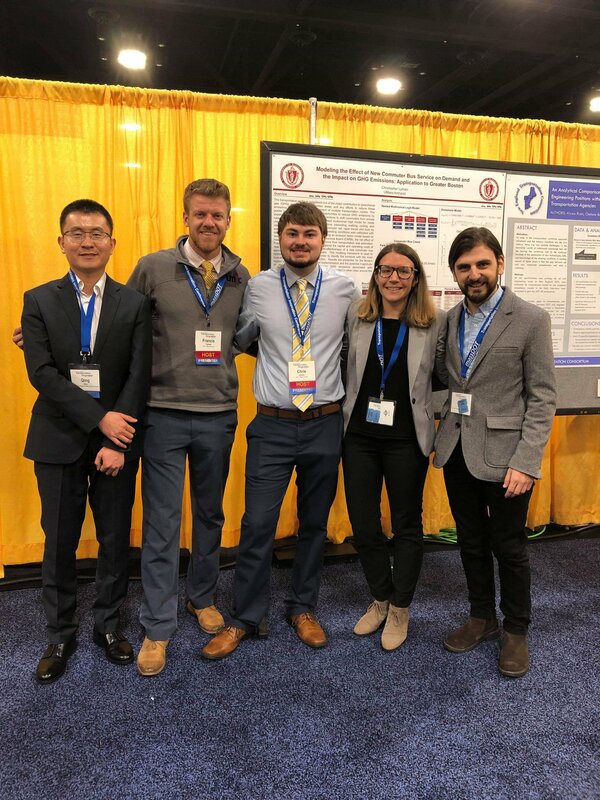 For undergraduate research assistantship, please check on the UMass Amherst Student Job Board, where openings in Ai Group will be posted periodically. For graduate research assistantship, please refer to the Graduate School Admission Office for general requirements, and email Dr. Chengbo Ai with your recent CV and names of your references. For postdoctoral researchers, please directly contact Dr. Chengbo Ai to further discuss your research interests and plan. [2019-04-10] Best Poster in MassDOT Transportation Innovation Conference. Congratulations, Qing for winning the best poster in MassDOT Transportation Innovation Conference. 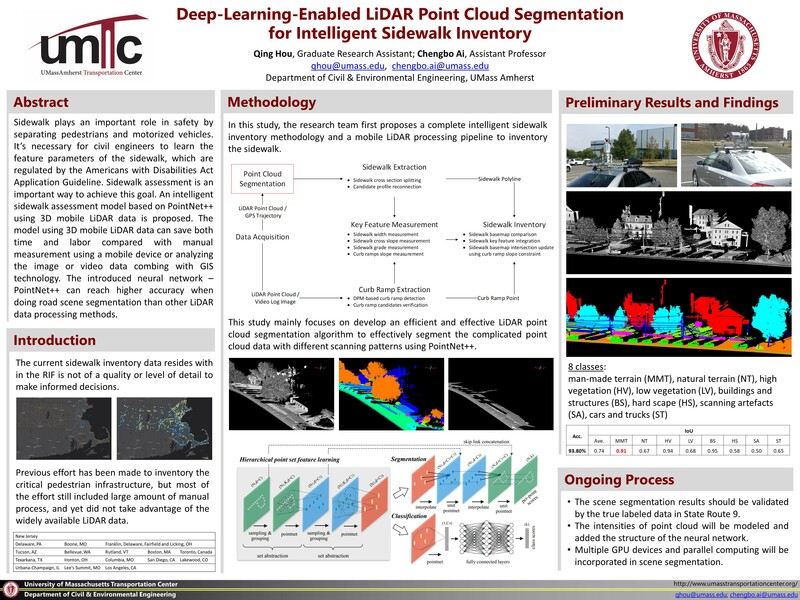 The research title is “Deep-Learning-Enabled LiDAR Point Cloud Segmentation for Intelligent Sidewalk Inventory“. Congrats to Harris and Katerina as well (Picture source: Katerina). [2018-12-18] Welcome Yash to our group. Yash received his Bachelor degree from Electronics and Telecommunication Engineering at Pune Institute of Computer Technology and started pursuing his Master in Electrical and Computer Engineering at UMass. [2018-11-06] Paper on utility tunnel route optimization accepted in ICTD 2019. A paper titled “Utility Tunnel Route Optimization for New Development in Urbanized Areas” has been accepted by the International Conference on Transportation & Development 2019. A new underground infrastructure layout optimization method is developed in this paper for newly developed, urbanized regions. [2018-11-06] Paper on a national horizontal curve inventory accepted in ICTD 2019. A paper titled “Development of A Nationwide Horizontal Curve Inventory Using Open GIS Data” has been accepted by the International Conference on Transportation & Development 2019. More than 150,000 miles of the United States Numbered Highway system has been processed and validated by only using the publicly available GIS basemaps. [2018-09-04] Welcome Yuhao to our group. Yuhao received his Bachelor degree from Beijing Information Science and Technology University in Electrical Engineering and Automation in June 2018 and joined Ai’s Group in 2018 Fall to pursue his Master in Transportation Engineering.